Roundup is the brand name of a systemic, broad-spectrum herbicide produced by the U.S. company Monsanto, and contains the active ingredient glyphosate. Glyphosate is the most widely used herbicide in the USA, and Roundup has been the number one selling herbicide worldwide since at least 1980. Roundup (glyphosate) has been found to cause the death of human embryonic, placental, and umbilical cells in vitro, even at low concentrations. Glyphosate is toxic to human skin cells, through causing oxidative damage. 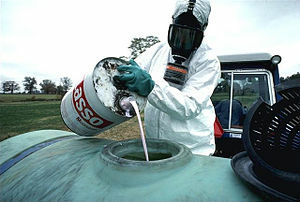 Roundup is used widely here in the United States. Through farming applications, these chemicals are released into our air, and the runoff from its heavy use contaminates our streams, and groundwater. Initially introduced to the market in 1996, genetically modified foods or biotech foods are foods derived from genetically modified organisms. Genetically modified organisms have had specific changes introduced into their DNA by genetic engineering techniques. Typically, genetically modified foods are transgenic plant products: soybean, corn, canola, rice, and cotton seed, but there are many, many more. A majority of the corn and sugar beets grown in Colorado are genetically altered. In fact, they are two of the largest crops in the state. GMO products have been linked to organ failure, brain damage, autism, gene transfer, and have been banned in many countries including Japan, China, Hungary, Venezuela, France and Ecuador . Some of these countries have gone as far as banning ALL GMO products. Monsanto has also developed a line of “Roundup Ready” products which go hand in hand with their herbicides, including Roundup Ready corn, Roundup Ready soybeans, Roundup Ready alfalfa, Roundup Ready sugar beets and Roundup Ready canola. These products are designed to make the plants resistant to Roundup, to keep up with the ever-increasing use of herbicides which contaminate our soil, air and water. Almost all processed foods contain GMO products, usually in the form of corn (high-fructose corn syrup and modified corn starch being two prime examples). There is a growing movement across the U.S. to label foods containing GMO products, so consumers can at least have the knowledge of what they are purchasing. Monsanto contributes hundreds of thousands of dollars every campaign cycle to politicians, from the federal down to the local level. Monsanto lobbyists are also involved in the political process and are rumored to be the actual authors of the “Monsanto Protection Act”. Former Monsanto employees are involved in every level of government, from Obama’s recent appointment of Michael Taylor (former Monsanto vice-president of public policy) as Deputy Commissioner for Foods at the United States Food and Drug Administration (FDA), to Supreme Court Justice Clarence Thomas (a former Monsanto executive). This “revolving door” between Monsanto and the government leads to the easing of regulations and more Monsanto products being used both here and abroad. Under the guise of supporting education, Monsanto contributes massive amounts of money to schools and universities, usually in the form of helping develop their agricultural programs. Monsanto uses this monetary influence to help push their products and research into our school system, from school gardens using GMO seeds to genetic , agricultural, and chemical research at the university level. Monsanto has gone into countries all over the world and introduced their GMO products, leading to a huge drop in biodiversity through cross-pollination and the use of industrial farming techniques. Locally owned family farms have seen their livelihoods devastated, and the health of their people decline through spraying of Roundup and other pesticides and forcing them to buy processed, inorganic foods because all available farmland has been converted to these industrial farms. Recent studies have shown a link between systemic pesticides such as Roundup and the growing problem of Colony Collapse Disorder, a malady that is resulting in the mass die-off of bees across the world. Pollen from GMO plants can also have ill effects on the bee community. Without bees to pollinate them, plants can not reproduce. Its that simple. In the face of a massive multinational corporation like Monsanto , its easy to feel disempowered and hopeless, but fear not! EDUCATE, EDUCATE, EDUCATE! Raising awareness about Monsanto is step one. When you’re finished reading this, tell someone about it, get online and do your own research, pass it on to someone else! It all begins with just getting the word out to the community about what this company does and the fact that they’re doing it right here in Colorado! There are groups here in Colorado and abroad that are actively working to expose and rein in this evil corporation. 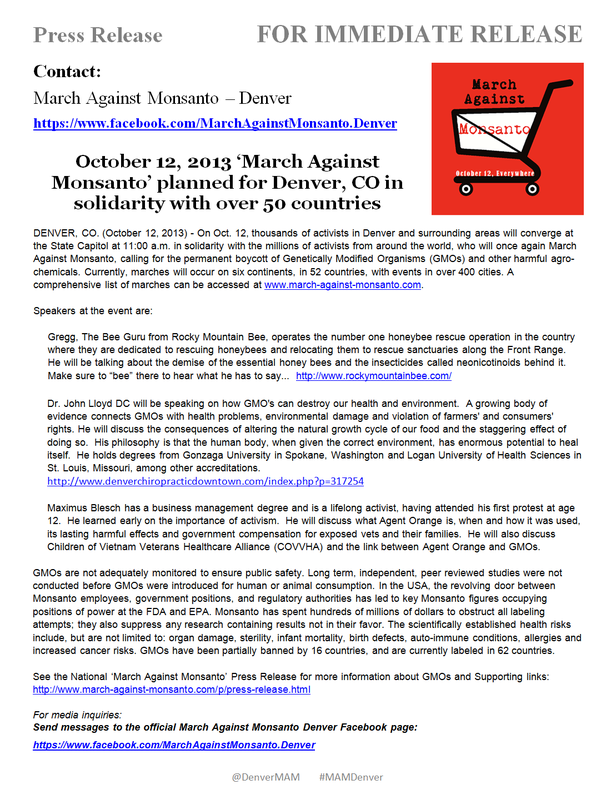 Check out GMO-Free Colorado and the March On Monsanto world event on May 25, 2013. On an individual level, one of the most important things we can do to combat Monsanto is DON’T GIVE THEM YOUR MONEY! Boycott Roundup and other Monsanto products, try to avoid buying processed foods and commercially grown vegetables, start buying your produce at local farmers markets and organic food stores instead of the big chains. RESISTANCE IS FERTILE! Instead of buying anything at all, grow your own veggies at home, or at a community garden. SAVE YOUR SEEDS! When growing your own food, make sure to use organic, heirloom seeds that can re-germinate and be used over and over. One of the ways Monsanto has forced out small farmers is to genetically modify their seeds so they don’t reproduce, forcing farmers to buy new seed for every crop. By saving seeds and sharing them with other farmers and gardeners, we can make sure that we maintain the thriving biodiversity this world so desperately needs. Are You Eating This Popular Food Linked to Cancer? Opinionator: Why Do G.M.O.’s Need Protection?